Part 3 – What do we know about the hardware of the system, and can we increase efficiency and lower costs? Discharge controller/inverter – now we approach the components that started this blog. Getting the energy out the storage and into the food. To invert or not invert? 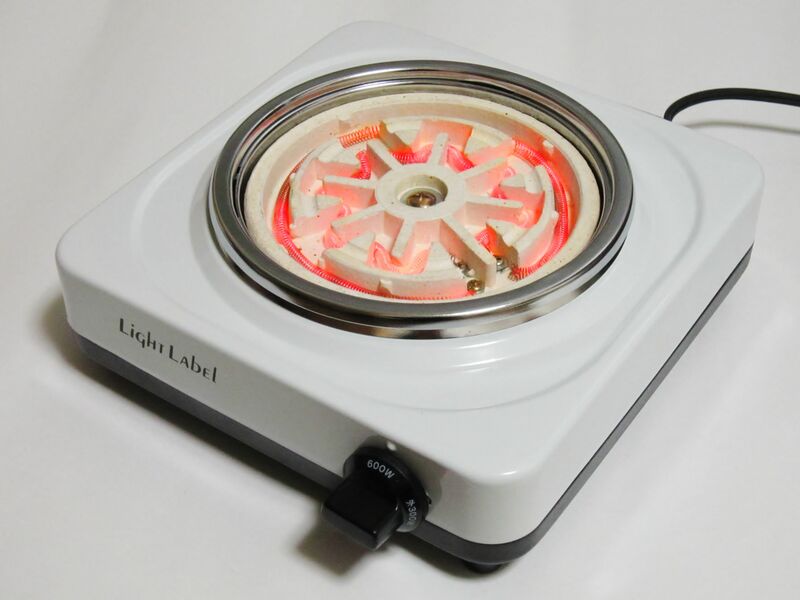 When we started the first experiments we found that cooking rings at 12V were just not available. We could have commissioned such a ring, but were persuaded by various colleagues to just invert for the moment and use commercially available hobs. Since then we have found 12V heating elements (500W for dumping surplus energy from a solar panel to water), but have not really pursued the non-invertion option. If we run 500W with 12V then we are running a 40amp current – and the diameter of the wire becomes important. 40 amps will heat up standard wires and blow (20 amp – camping) fuses, so the internal design of the product could become important. Easier, and making 1kW hobs possible, is to invert back up to 220 or 240V. So in most of our trials we are inverting back into that range. What do we know? We know that it is possible to create a system that doesn’t invert back into a higher voltage – but we know that including an inverter seems the simplest way forward. We could perhaps save 2 or3% efficiency losses by not inverting. Cooking hob – So this whole blog started because people kept saying ‘what about induction hobs?’. When we started we considered a simple hot plate hob. The rationale was based on cultural acceptability more than efficiencies. We reasoned that a hot plate (something that actually glowed and you could put your hand near and feel heat) would be more comprehensible and therefore more acceptable to people who had lived their lives cooking on an open fire or charcoal stove. If we accept a hot plate as a starting point, then we need to consider how to improve the efficiencies of a hot plate. Strong contact with the pot, and the pot being bigger than the hot plate. Inefficiencies of 20% have been attributed to badly fitting pots. There are also inefficiencies downward. The heating coil on a cheap portable hotplate radiate down, and so some observers report that a hot plate can be between 55% and 70% efficient. 70% actually seems low if you have really good fitting pan and no downward radiating. What do we know? We know that a hot plate is easily understandable to people, that it will work with existing pots and pans, its easily controllable, and that it is important to optimize energy use by getting pans that fit the hob, and stopping downward radiating heat. And this is where people ask, what about induction hobs. They can be 90% efficient. This seems to be true, and as discussed in the other blog, there are programmes for induction hobs in Ecuador, Paraguay and India on the basis that the cumulative savings in energy would be significant for a National grid. Also though as discussed in the other blog, I don’t actually know whether an induction hob will work with a pure sine wave inverter. However, even if it does work with, or can be made to work with, a battery, I still have some reservations. It would need at least a pure sine wave inverter which adds to the cost of the system (about 8% at todays prices of inverters on 2020 system cost). People would also have to have bundled steel pots and pans. Many existing pans are aluminum which would not work with induction hobs. This is not a deal breaker, but induction use does take some education – so the price of an educational campaign would have to be included in the programme costs. ← Part 2 – What do we know about the hardware of the system, and can we increase efficiency and lower costs?